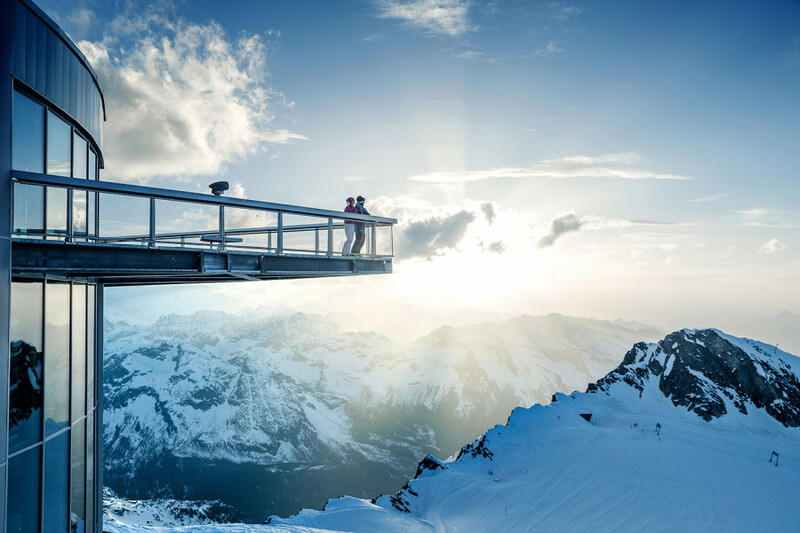 Elevated between 2989 ft and 9938 ft, the Ski Resort is among the 10 highest elevated Ski Resorts in Austria. The vertical drop from summit to base is 6949 ft. The average difference in altitude between base and summit of Ski Resorts in Austria is 2392 ft. Most runs are therefore relatively long. Kitzsteinhorn Kaprun is among the 10 best rated Ski Resorts in Salzburg. Season starts on Oct 12 and ends on Jun 2 (233 days). Average season duration in Austria is 114 days. Average snow depth during the season (Oct 12 to Jun 2) is 79 " at summit elevation and 28 " at base elevation. Snow coverage is usually best during March, offering an average snow depth of 102 " at summit elevation and 48 " at the base. Therefore Kitzsteinhorn Kaprun is among the 3 ski Resorts with best snow conditions in Austria. Kitzsteinhorn Kaprun features 106 sunny days on average per season. The average for all ski Resorts in Austria is 111 sunny days. May is the sunniest month with an average of 22 sunny days. Directly from the village of Kaprun with the aid of two new gondola lifts, first up the Maiskogel, from there to the Langwiedboden and the very heart of the Kitzsteinhorn glacier ski area! Ski-in-Ski-out, 100% snow guarantee from October until well into springtime, along with a wealth of new opportunities – priceless benefits that further solidify Zell am See-Kaprun’s position as a top destination in the Alps. For unsurpassed winter sports, memorable family holidays or high-alpine sightseeing that reaches all the way to the TOP OF SALZBURG at 9,940 feet above sea level. Kitzsteinhorn is the only glacier ski area in Austria’s Salzburger Land region, and a place where you can clip into your skis from autumn onwards. The area offers some 41 kilometres of trails to discover, as well as five freeride routes for anyone keen to explore the powder. In winter, the Kitzsteinhorn ski pass is also valid for Zell am See – Kaprun. On Kitzsteinhorn mountain itself, you have to take the Gletscherbahn I + II lifts to reach the highest point in the ski area and the so-called “Gletscherwelt 3000” zone, where you can continue your upwards journey with the Gipfelbahn lift. There are several gentle blue-marked runs on offer, such as the Rettenwandabfahrt and the lengthy Alpincenterabfahrt. In winter, beginners can instead hone their skills in the lower-lying Maiskogel and Lechnerberg area. 25 kilometres, or more than half of the trails overall, are marked red and therefore promise plenty of fun and exhilaration for proficient skiers. The Gletscherseeabfahrt, for instance, is the perfect place to carve some turns while enjoying incredible panoramic views. The Kristallbahnabfahrt is also a favourite among skiers who prefer challenging runs. There are only two black-marked trails in the ski area ­– Maurerabfahrt I+II. However, expert skiers will find plenty of terrain to challenge them off-piste on the Kitzsteinhorn – it has very much earned its reputation as one of the most popular freeride destinations in all of the Alps. Directly next to the lifts, there are five off-piste routes of differing difficulty, such as the relatively challenging Pipe Line, which, although short, is very bumpy and requires plenty of balance. The Jump Run is another tough route requiring nerves of steel. If you prefer to find your own lines, you can find out where it is safe to do so at the Freeride Information Base between the Gletscherjet II and Langwiedbahn lifts. You can also learn to correctly use avalanche search devices and freeride accessories in the avalanche search area. 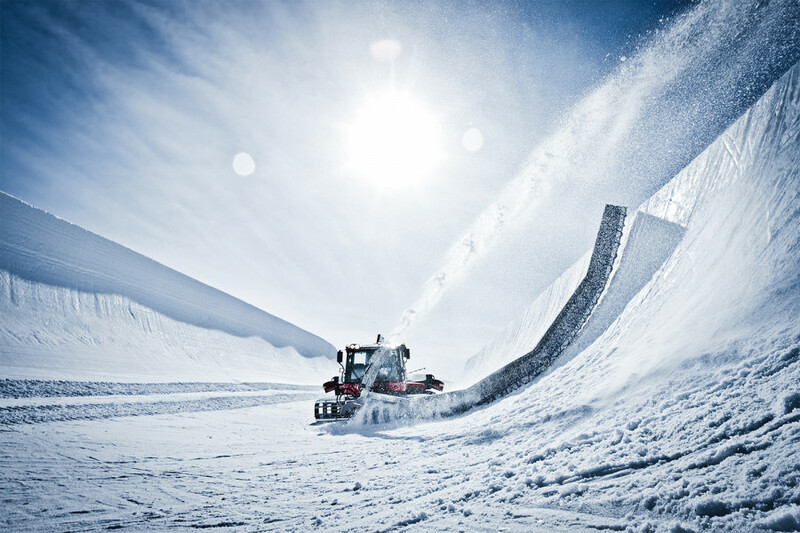 For almost 8 months a year, you can get an extra dose of adrenaline at three world-class snowparks between 8,000 an 9,500 feet. All playgrounds are shaped fresh every day, and there`s boarder pleasure for beginners and pros in the mix of easy, medium and pro lines. 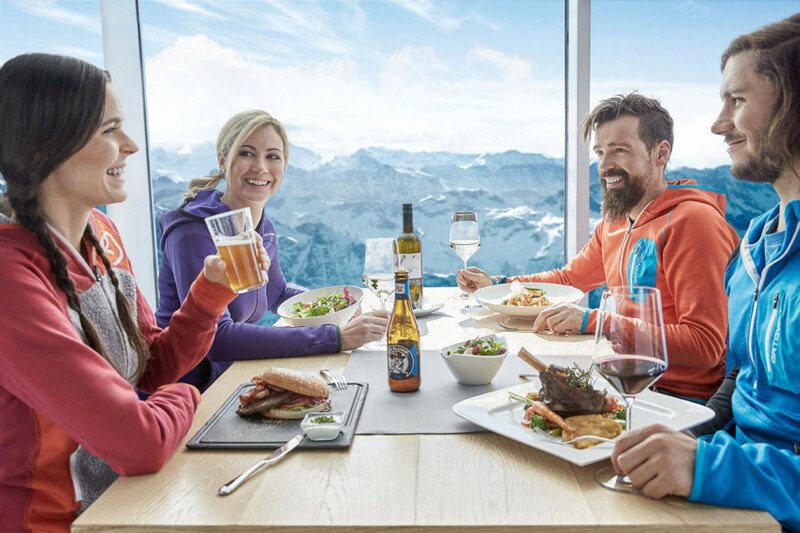 Let the Kitzsteinhorn`s many restaurants and bars take care of all your culinary needs. Whether you want typical Austrian fare, innovative cuisine or something romantic, you`ll find whatever you desire – from breakfast to après-ski between 3,000 and 9,800 feet. Kitzsteinhorn offers a special challenge for skiers: “Black Mamba”, a groomed slope up to 63% steep! The black piste 14 is 1000 metres long, covers 290 metres in altitude and is venomous like a mamba – perfect for all experts who love it steep! The run starts at the valley station of Kristallbahn at 2,265 metres and ends at Langwiedboden. No visit to the Kitzsteinhorn would be complete without a visit to the Gipfelwelt 3000. High up above 3,000 metres, this zone boasts several different attractions. 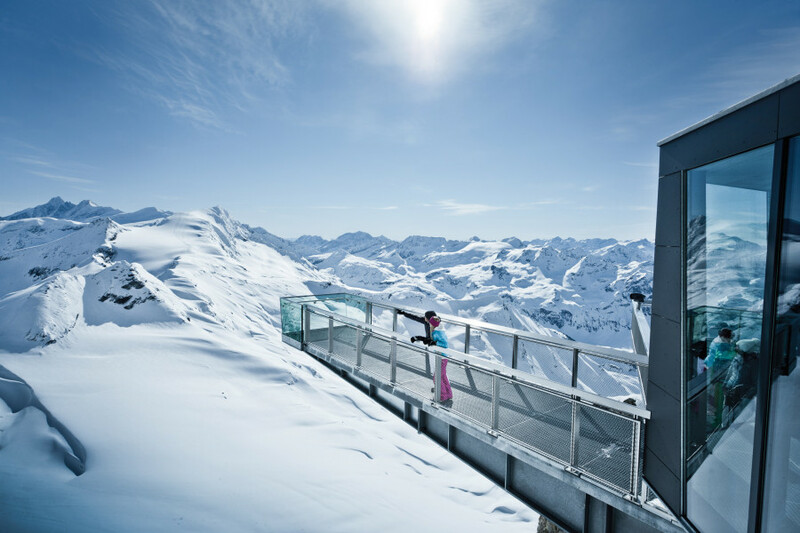 When you arrive on top of the mountain, you can pass through a 360-metre tunnel which has been dug into the peak of the Kitzsteinhorn. As you pass through the tunnel, you can learn lots of interesting facts about the mountains of the Hohe Tauern region, including how they were created, their crystal deposits and the permafrost in the ground. As soon as you reach the end of the tunnel, you can step out onto the panoramic Top of Salzburg platform. The views over the Limestone Alps, Lake Zell and the Kapruner Valley are quite simply stunning. What’s more, you can even visit a cinema on the glacier! In Cinema 3000, you can enjoy spectacular views over the landscape and insights into animals that live in the region around the Kitzsteinhorn. If you’d prefer something a little more action-packed in summer, you can take the shuttle down to the Gletscherplateau and Ice Arena. In summer, this is ideal walking country and even allows sledding all year round. And if you need a break, the Schneestrand is a great place to unwind. The Häuslalm in the Langwiedboden area is the number one spot on the glacier for après-ski. If you want to continue the party after the mountain closes, there are numerous pubs, bars and discos in Zell am See and Kaprun – two towns certainly known for their nightlife. Popular spots include the Baumbar-Reiteralm, Beach Club Zell am See, Flannigans Irish Pub and the table-dance bar Hips. At the Gipfel Restaurant, situated at an altitude of 3,029 metres, star chefs join forces twice a year to treat guests to culinary delights under the banner “Hochgenuss”. There is also a wide range of excellent restaurants to choose from in Zell am See and Kaprun. Kitzsteinhorn is around 2 1/2 hours from Munich. To make the journey by road, take the A 8 towards Salzburg, then keep right at the Inntal junction and follow signs for the A 93. Leave this road at the Oberaudorf exit and continue on towards Niederaudorf, following the B 178 until you reach Kaprun. Zell am See is also conveniently accessible by rail. Free buses take skiers and snowboarders from the train to the valley station of the lifts free-of-charge. The nearest airport is in Salzburg. Various shuttle services offer skiers who fly in ideal access to the Kitzsteinhorn.